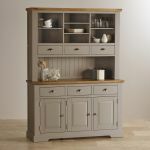 Make an impression with the St Ives large dresser, made from 100% painted hardwood and with natural oak tops throughout. 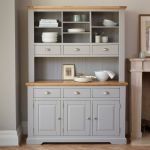 With its light grey paint finish, the dresser is chic and modern. 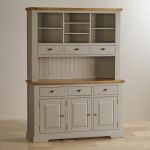 The impressive style of the dresser starts with the solid, bracket feet at the base. Three shelved cupboards sit below three drawers that span the width, echoed in the dresser top. 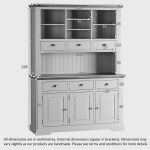 Shelving above these can be used to display favourite crockery or other effects. 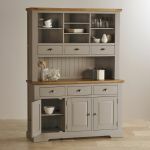 The St Ives large dresser is impressive enough to work on its own as the hub of the kitchen or dining room, or you could decide to match it with other pieces in the range in the dining room or home office. 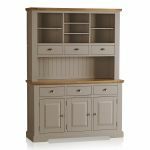 Browse through the St Ives collection and design your home’s interiors using the range.